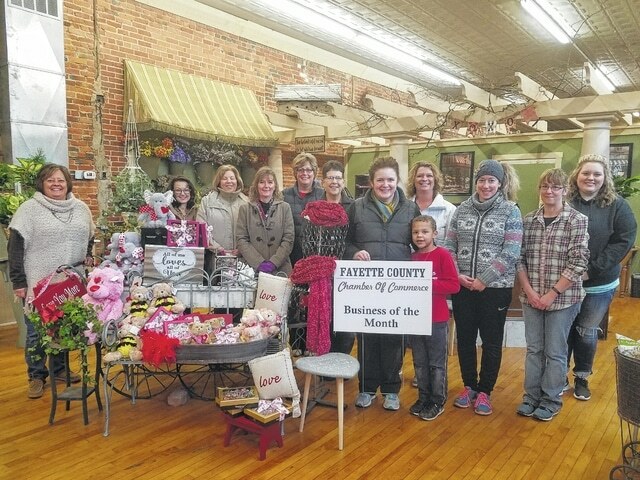 Back-En-Thyme Flower & Gift Shop, 101 E. Court St. in Washington C.H., was named the Chamber of Commerce Business of the Month for February. The store offers fresh cut flowers, silk arrangements, candy, gifts, home décor and more. According to their motto: When ordinary just won’t do, call Back-En-Thyme and they’ll create it just for you! Owner Kendra Hernandez, son Matticks and staff are joined by the Chamber Ambassador Team. https://www.recordherald.com/wp-content/uploads/sites/27/2017/02/web1_22017-BackenThyme.jpgBack-En-Thyme Flower & Gift Shop, 101 E. Court St. in Washington C.H., was named the Chamber of Commerce Business of the Month for February. The store offers fresh cut flowers, silk arrangements, candy, gifts, home décor and more. According to their motto: When ordinary just won’t do, call Back-En-Thyme and they’ll create it just for you! Owner Kendra Hernandez, son Matticks and staff are joined by the Chamber Ambassador Team.